This entry was posted on Sunday, 7 November, 2010 at 21:49	and is filed under Star Trek. You can follow any responses to this entry through the RSS 2.0 feed. You can skip to the end and leave a response. Pinging is currently not allowed. 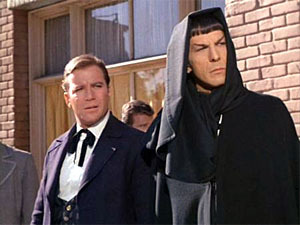 I saw a bit of this episode when I was channel-surfing (one of the local stations in my area runs “Trek” reruns) and was intrigued by the period costumes. I love whenever the crew of the Enterprise needs to change their outfits to blend in. Anyway, I tracked the episode down to watch the whole thing, and I was disappointed by the plot. My favorite episode with costume change is probably the one on the gangster planet. Now that I think about it, my favorite Trek movie is IV, when they all need to dress like people in San Francisco in the 1980s. I didn’t get the impression that the Red Hour happened every day, but rather much more infrequently. I always liked this episode, plotholes notwithstanding, but the thing that bothered me most about it was the time-period jump in the costuming. (I’m a bit of a historical fashion geek.) When Sulu explains that ‘these are the clothes they wear’, he’s dressed in approximately 1770s-80s clothing, with a cravat and a tricorn hat. Then, when the rest of the crew beams down, they’re dressed in clothing from about a century later (Wyatt Earp times? ), and so are the other inhabitants of Beta III. It’s quite puzzling, and rather annoying when one has gotten one’s hopes up for seeing Captain Kirk in a cravat. The body count needs updating. A Lawgiver kills Tamar with his staff shortly after the landing party arrival at Reger’s house.